Newer chalet-style mountain home on 3 levels with a 1/2 acre lot surrounded by forest on 3 sides. Three full bedrooms (Master Bedroom Loft with Queen Bed) and 3 full baths; lower level spa bath has a double Jacuzzi whirlpool tub. Downstairs, a large family room, separate laundry room and home office (bring your own laptop but WiFi may or may not be available and we don't guarantee a connection). Wildlife, including deer and occasionally black bears, wander through our community. Pool and tennis court on premises (pool open Memorial Day to Labor Day). Please NOTE that our insurance policy does NOT permit grilling or any kind of cooking outdoors! The home is only 20 minutes' drive to the Skyline Drive and Appalachian Trail -- the surrounding area is full of Civil War sites, fruit stands, and antique shops. Summer, Spring, and Fall are the seasons for various festivals in the nearby historic Town of Front Royal. The tasting rooms of Linden Vineyards and Fox Meadow Vineyards are less than 5 miles from the home and there many other wineries nearby, specializing in Chardonnay. Horseback riding and golf are nearby. In winter, a 4-wheel drive vehicle is suggested in case of snow on the roads. Linden is an easy drive from Washington DC or Dulles Airport on Route 66 (about 65 miles, a little more than 1 hour). There is a rather steep concrete driveway leading from the road to the house (use low gear). There is a staircase with 13 steps leading from the driveway/parking area to the front door so the house is NOT really handicapped accessible. Some personal amenities are included with your rental, including paper products, kitchen condiments, dishwashing detergent, and usually, a few beers and frozen pizzas in the refrigerator. You will find music CDs on our shelves, guidebooks to exploring Virginia, road maps, discount coupons to local attractions (when available) and other 'extras' not found in other rental properties. We have a collection of about 30 movie videos but NO CABLE TV in this home. Couple from Northern Virginia owns the home and has lovingly furnished it with antiques and local handicrafts in addition to comfy new furnishings. We don't smoke and don't want smokers in the house, and we have no pets or plants for you to maintain. We don't permit animals of any kind in the house and strictly limit occupancy to 7 (6 in beds and 1 in a rollaway). The house is NOT childproof and there are breakables and stairs, so we don't allow children under age 10. In short, we treasure this home and want renters who will treat it as their own, with care and respect. Linden is a lovely area in the foothills of the Appalachian Mountains and only about an hour from the Washington DC area, so we can get there quickly, regardless of traffic. We did not want to drive 2-4 hours to reach the hiking and rafting that we love on the weekends. In addition, the town of Front Royal, only 5 miles away, has everything (shops, restaurants, movie theatre, museums), so we don't feel like we've completely left civilization behind. There are excellent hiking and exploration opportunities in Linden, including wineries, so there's always a lot to do. Our community also has a tennis court and pool, so it's a nice getaway without a lot of driving. For history buffs, this is a key spot to study the Civil War. The principal contrast between our life in Northern Virginia and the country life is the absolute quiet. No ambulances, loud TVs, street noise, etc. (although occasionally someone uses a power tool in his or her yard). We see wildlife unexpectedly which reminds us that we humans are but one of the species of creation. This home is just a great 'getaway' where relaxation comes easy. Large genuine Jacuzzi tub in lower level bath. The Community is Mostly Low Hills in the Foothills of the Appalachian Mountain Range. Complete large laundry room on lower level, with washer/dryer and ironing board/iron. Driveway accommodates 2 or 3 cars. All dishes, glassware, utensils and cooking equipment is provided, including coffee maker and other small appliances. There is an Eat-in Kitchen with Table and Chairs, comfortably seating 6 persons. We Have a Collection of CDS Including Opera, Jazz and Cocktail Lounge/Easy Listening with a Few Country and Rock N Roll CDS Mixed in. Front Royal is the 'canoe capital' of Virginia, with many outfitters offering canoe rentals and tours. The Deck Goes Across the Front of the House Permitting Mountain Views. The community has a tennis court, 5 minutes away (free). The Community Pool is Open from Memorial Day to Labor Day. We had a delightful visit to Front Royal for a nearby wedding. "The Nest" was the perfect comfortable home away from home for the 2 of us (although the house has 3 BR), tucked into a tranquil forested hill. Lee is the consummate hostess, leaving us thorough information about the house/community, wine/snacks in the frig, and an open invitation to enjoy their lovely property. Very clean and well-furnished with all you need. Location is near north entry to Skyline Drive through Shenandoah National Park where we enjoyed hiking. We stayed at 'The Nest' for a week and had a relaxing and rejuvenating time there. The nest has all you need for a family get-away, amidst tranquil setting , Dears grazing around .. It allows you to share the city fun in closeby D.C and also other activities like wine-tasting, canoeing , golfing etc. Thumbs up to Lee for providing and managing a great place! Lee and Hugo's nest is the perfect getaway from the hustle and bustle of the city. 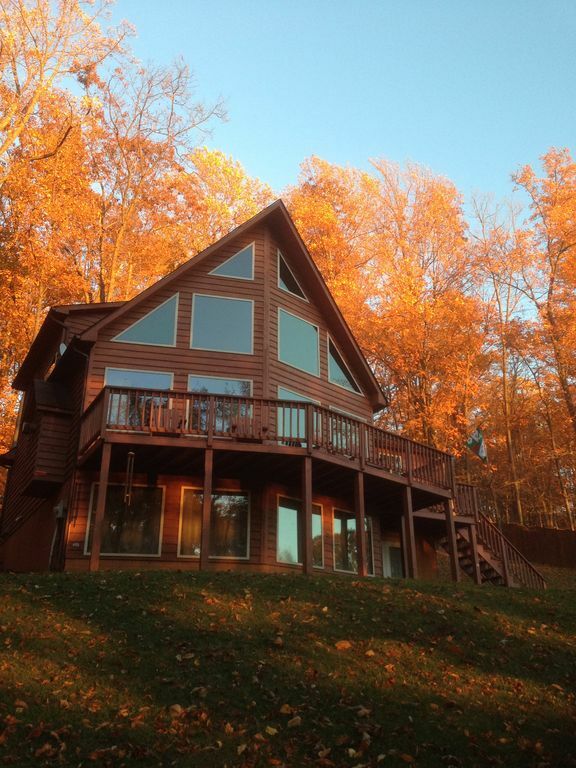 The location atop High Knob hill adds provides a quiet, refreshing and rejuvenating retreat. You will be greeted by misty mornings and occasional deer sightings everyday. The house is extremely well kept and very tastefully furnished. The Nest was spacious enough to accommodate our party of 7. I would recommend this place to anyone who is interested in visiting the Shenandoah National Park as its just a stone throws away from the Northern entrance. Historic Front Royal is Only 4 Miles Away (Civil War Venue) and Several Virginia Wineries Are Within 10 Miles of Home. Front Royal is the 'Rafting and Canoe' Capital of Virginia and Outfitters Are Within 15 Minutes of the House. MINIMUM CONTRACTUAL RENTAL PERIOD IS 31 DAYS. WEEKLY RENTALS ARE NOT PERMITTED BY WARREN COUNTY, VIRGINIA. IF YOU WISH TO DISCUSS THE RENTAL PERIOD or plan to check out early, the rental agreement will nevertheless cover 31 days. PLEASE CALL OR EMAIL THE OWNER FOR DETAILS.